The £790m Forth Bridge replacement project is a major infrastructure in the UK, safeguarding an important connection in Scotland’s transport network. Construction of the 1.6 mile long, cable-stayed bridge, started in summer 2011 and is scheduled to open in autumn 2016. The new bridge consists of 3 towers each being 207 metres above high tide. The entire bridge will use 6300 tonnes of wire, which is 23,000 miles of stay cabling. WOW! With the globe being 24,901 miles at the equator, the entire amount of cabling used on the Forth Bridge would nearly stretch around the entire globe! 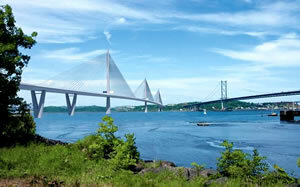 Why build a new Forth Bridge? Although there has been significant investment and maintenance on the existing Forth Bridge, it is showing signs of deterioration, and is not suitable as a long-term main road crossing over the Firth of Forth. The new road bridge is therefore required to maintain the vital connection in Scotland. One of the best advantages of the new 2 lane road bridge, and hard shoulder, is the modern wind-shielding feature which prevents traffic from being affected by wind buffeting, and it also minimises the risk of the bridge closing during high winds. This is a great added safety feature and assists in the bridge shining through the highest standards of civil engineering. Armorgard have been providing their fuel safes and chemical safes, for the contractors to store their cans of fuel and chemical in safely. One essential area that can easily be overlooked is the requirement to be compliant with the law regarding the safe storage of fuels and chemicals. View the Hazardous storage range that Armorgard offer. The 60 year old passenger terminal at Heathrow airport has been demolished, and is in the process of being replaced with a brand new building, which when complete, will encompass the latest.